Nguyen Van Luy and his wife Pham Thi Luy were dedicated patriots to both their home country of Viet Nam and their adopted county, the USA. Their lives and accomplishments were examples of the best of both nations. Nguyen Van Luy's story is outlined in the documents below. Like many other Vietnamese including the venerable Ho Chi Minh, he came to the US and worked as a chef. During WWII, he worked for the OSS against the Japanese occupiers of Vietnam. When the US launched its war against Vietnam, Laos and Cambodia, Luy became a leading activist among Vietnamese residents in the US. In 1967 as the anti-war movement was organizing a major demonstration confronting the Pentagon, the war machine itself, members of the Committee to Aid the NLF of South Vietnam persuaded the organizers to invite Van Luy to be the first Vietnamese speaker at a national anti-war speech on October 21, 1967 at the Lincoln Memorial. The National Mobilization organizers were concerned about what a Vietnamese might say and required a prior copy of his speech and needed to verify his identity beforehand. His two page speech attached was provided, yet those in charge that day, choose to cut off his mike half-way through his short speech at the Lincoln Memorial. He joined the CANLF committee and others assembled in a "Revolutionary Contingent" to march on the Pentagon. This group reached the side of the Pentagon and then when an opening was found in the fence, joined the thousands occupying the steps of the Pentagon the rest of the day a night. These events were described by Norman Mailer in his best selling Armies of the Night, which he acknowledged was his somewhat fictionalized view. After the events at the Pentagon and in the Occoquan prison, Mailer's secretary requested and we supplied a detailed account of events. Nonetheless, his novel distorts and manipulates events to give Mailer an enhanced role and to denigrate the politics of the many newer and younger demonstrators in the prison. I will shortly add a review citing some of the lies and suggesting the propaganda aims of this best selling "Novel as History." Nguyen Van Luy and his wife Thi Luu continued to work for peace and later normalization of relations between the U.S. and Vietnam. However, after the war ended, some of the most bitter and right-wing ex-military Vietnamese from the Saigon government organized and carried out assassinations in the US of both Vietnamese and other American citizens. 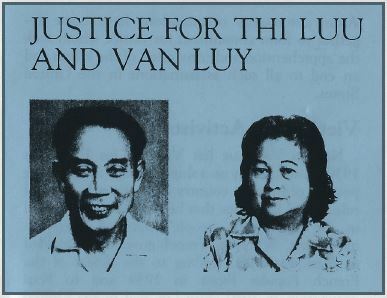 On May 28, 1984, Luy and his wife were both shot outside their restaurant. Nguyen Van Luy survived and continued to work to help both his communities.. On. - . NVL Speech at the Lincoln Memorial, October 21, 1967 - PDF. Links to Pentagon demo photos and Armies review - linking to growing radicalization and US fears and need to quell growing dissent. Justice support committee Committee for Justice for Thi Luu and Van Luy. Asia Resource Center on building awareness and support for Vietnamese and others attacked. Pentagon's 13 year Campaign to Revise History of the US War, to hide US war crimes and the anti-war movement. The Ken Burns propaganda film on The Vietnam War. Walter Teague's comments on the film series. 2015-05-1,2 Power of Protest event, to build awareness and opposition to the Pentagon Campaign. 2017-10-21 Vietnam Peace Commemoration Committee 50th Anniversary of the 1967 Pentagon demonstration. Add addition links to the other various anniversaries - Vietnamese trips - 1987, 25 year, 30 year, 40 year, etc. Written and posted by Walter Teague.